When phoning should you be unable to talk to one of us, Please feel free to leave a message and we will call you back A.S.A.P. We can only accept cash if paying on arrival. At junction with A96 follow signs for Inverness Airport and keep following the signs until directed to exit the A96 onto the B9039. When on the B9039 do not turn off into airport but follow on into Ardersier. At the T junction, take a left turn and then approx 400 metres along on the left you will come to Inchrye Bed and Breakfast (opposite football pitch). Keep along A96 until junction of B9006 signposted for Fort George and Ardersier. 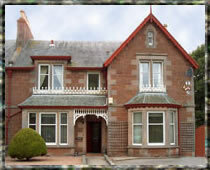 Once you enter Ardersier keep an eye out for a football pitch on the right hand side of road, Inchrye Bed and Breakfast is opposite.